The business partnership will help to introduce HealthPostures’ sit stands solutions to retailers, offices and industrial facilities located in the Seattle, Washington area. HealthPostures continues to grow its team of retailers. The sit stands ergonomics leader recently added Edge Ergonomics to its team of regional and national product dealers. The business partnership will help to introduce HealthPostures’ sit stands solutions to retailers, offices and industrial facilities located in the Seattle, Washington area. Standing desk solutions that HealthPostures develops and manufactures offer greater mobility, improved flexibility, more energy and reduced stress on muscles and joints. Products in the company’s assisted lift series are manually adjusted in seconds. The designs support single and dual monitor work stations. 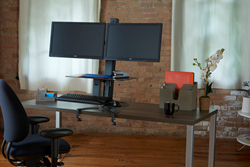 Increased automation comes through ergonomics standing desk products in HealthPostures’ electric and assisted lift series. The 6100 TaskMate Executive, 6200 TaskMate Journey, 6350 TaskMate Go and 6360 TaskMate Go Laptop are just a few of the sit to stand solutions in these two product lines. The dealer partnership came about, in part, because these products strengthen Edge Ergonomics’ office, industrial and retail options. They create a perfect marriage with Edge Ergonomics’ ergohuman chairs. The dealership partnership between HealthPostures and Edge Ergonomics is effective immediately. Organizations in Seattle, Washington can purchase HealthPostures products directly from Edge Ergonomics. Both ergonomics companies will continue to allow organizational, retail and individual customers to order their products over the Internet. Currently, HealthPostures offers free shipping on select items. Assistance with product selection is available at Edge Ergonomics through the company’s online Buyer’s Guide. Founded in the 1990s, HealthPostures LLC (https://healthpostures.com) has been a leader in the workplace solutions space for more than two decades. The company specializes in the design and manufacturing of workplace solutions like adjustable computer stand for desk, computer monitor stands for desk, sit stand keyboard designs and ergonomic sit stand chairs. Products that HealthPostures develops may help to relieve back and neck pain, headaches and other musculoskeletal disorders. A primary mission of HealthPostures' is to "strive to provide quality products that will help transform your sedentary life so you have a healthy way to work." Sought after ergonomics stand up desk equipment, including popular electric standing desks products, that HealthPostures designs include surface Taskmates, the TaskMate Go Laptop, dual monitor sit stand work stations and Stance move seat extensions. The company's strong reputation and proven products and accessories continue to attract regional and national distributors and resellers. Edge Ergonomics sells ergonomic chairs, tabletop workstations, desktop stations and ergonomics accessories. The company’s range of accessories include footrests, key pads, keyboards, keyboard trays and mouse pads. Edge Ergonomics is a family owned company that has a mission to provide office products that improve customer comfort, health and posture. Prices at the company are competitive. The company’s founders have roots in the Pacific Northwest and are committed to improving Americans’ overall health and wellness. In addition to HealthPostures’ products, Edge Ergonomics carries items manufactured by top brands such as Airopedic, ERA Products, ErgoRX, Flash Furniture and Good Use Company.